With its patented design, the Jansen FS-35Speed flywheel wood splitter constitutes a revolution in wood splitting. It would be virtually impossible to split a large quantity of firewood more quickly than with our wood splitter. The FS-35Speed exploits the principle of kinetic energy, i.e. the momentum from a heavy flywheel. The splitter generates kinetic energy of 35 tonnes - sufficient to split every piece of wood grown in German forests. In principle, this type of wood splitter is not a new invention but has been available since the 1960s, especially in the US. However, the drive unit of our splitter has been refined. Thanks to a patented combined technology involving a special coupling system in conjunction with a centrifugal clutch there is virtually no load placed on the drive pinions and gear rack. This is certainly not the case with our system. Our patented technology means that the drive pinion and gear rack are permanently engaged. This ensures extremely long service life and great user friendliness. 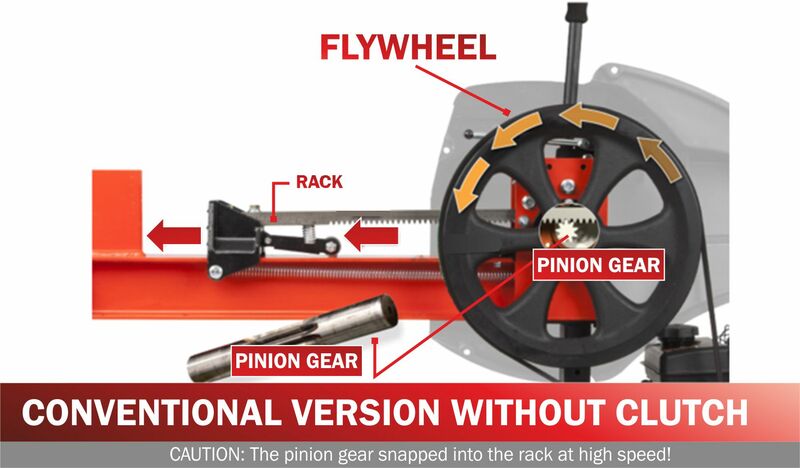 Our equipment also avoids the customary “hard blow” to the palms when engaging the drive pinion in the gear rack. The following drawing will make things clearer. Splitting slider velocity: approx. 3 sec. Just taken delivery of a Log splitter, the Jansen Rotary FS- 35 ton with Briggs & Stratton petrol engine. WOW! what a machine, its effortless to use and so well made, smooth process and lightening fast, splits all wood like cutting butter! Wish I'd bought one years ago. Only thing I would say is you do need an engine hoist in order to lift the unit onto the axel as incredibly heavy, but once on there and assembled (around 2-3 hours) there is no stopping you! Split 3 dumpy bags in 45 mins. Love it! Definitely recommend this model, previously had a hydraulic splitter and this is by far so superior. Very satisfied customer. Dear Sirs. I very recently purchased a Jansen fs35 flywheel type logsplitter from yourselves. I am completely overwhelmed with the quality and efficiency of this machine. It is truly outstanding in all respects. 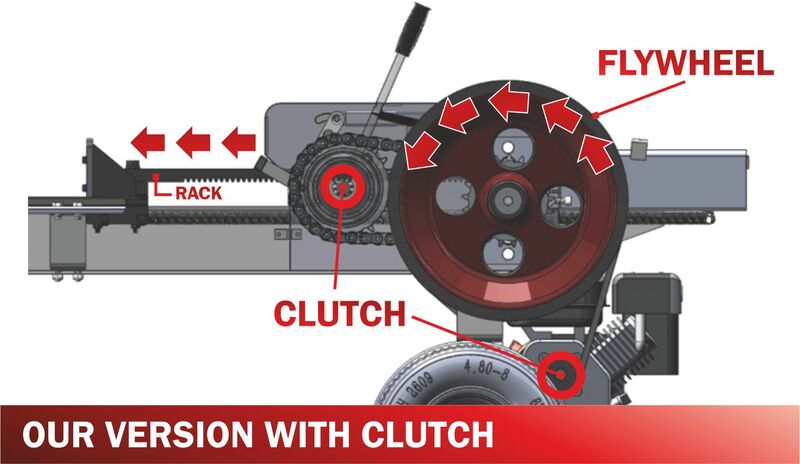 I am particularly impressed with the clutch and down gearing arrangement which allows for a slower extension of rack therefore being rather less alarming than others of a similar type. The towbar itself is a work of art. At last a tool designed with functionality at its heart. Please feel free to put any one in touch who may need reassurance before a purchase. Expensive yes. But very much worth the money. A seriously well satisfied customer. James Lee.